My trip started in Cape Town, safari would follow. I had no expectations. 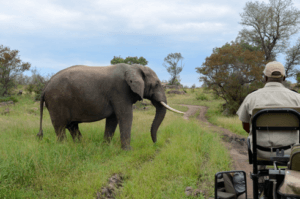 I sell safari vacations but had not experienced a Kruger safari yet. My colleague and I caught our flight from Cape Town to Skukuza Airport, which is near Kruger National Park. The airport was tiny. The building looked more like a nicely designed lodge than your typical airport. Our guide was waiting for us with a sign that had our names. We grabbed our luggage, put them in the safari vehicle and headed out. 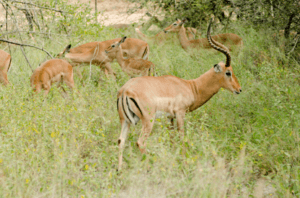 We didn’t even drive 5 mins before seeing a group of Impala grazing by the road. That was cool! We continue to drive and see wart hog. Ok, I’m getting a little excited now. The drive to the lodge is 60 mins down a dirt road and we are only 30 mins in! 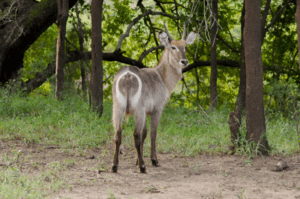 We continue driving and there is a waterbuck that turns around and looks at us. We stop and look at him and there we are…staring at each other. It was beautiful! At this point, I’m excited. I can control my excitement pretty well and even now, on the outside, I look unimpressed but on the inside I’m like a kid! My inner voice is saying “Oh my gosh, I can’t believe I’m here!”…“I can’t believe I’m seeing these wild animals!” and “This is so exciting!” I’m just so excited by now! Right before we get to our lodge, we round a corner and ever so still is a giraffe standing there. He is so still that we don’t even notice him right away! We stop so we can gaze at him because he was so majestic. We are sold. We are thrilled. We are ready for our first REAL game drive. This was just the drive to our lodge! We arrive at our lodge where they have Shandy’s waiting for us. We check in and they show us to our rooms. Next level of excitement. Whilst our lodge was quite high end, you can’t help but be impressed by it. 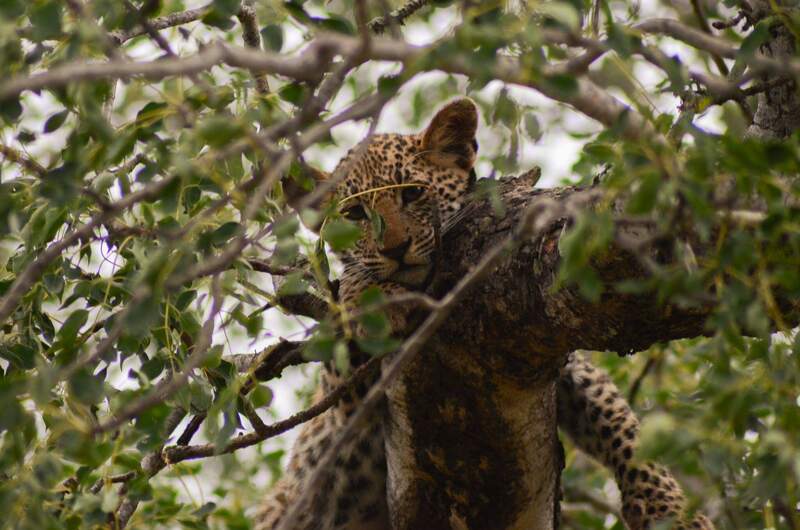 If you’ve never researched safari before and do not know what to expect, DON’T…let us surprise you! Safari lodges are especially beautiful, well designed and comfortable and Sabi Sabi Earth Lodge was no exception. You can see a live video of my room on Facebook by searching “South African Airways Vacations”, it’s dated April 21, 2018. It’s pretty darn cool! The staff were kind, accommodating and easy to talk to. It’s not unusual to see animals wander on or near the property. 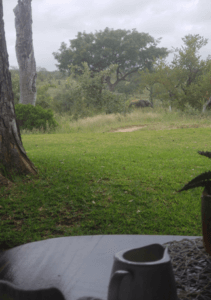 One morning, while having breakfast there were wart hog and elephants nearby! They made us lunch, which was delicious! The grounds were peaceful and beautiful! Then we prepared for our first game drive. We loaded up with 2 other people and headed out. Our first sighting was of a single elephant! 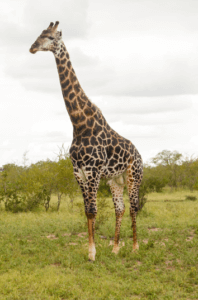 The majority of lodges have game drives twice and a day, giving you lots of opportunity to see animals. 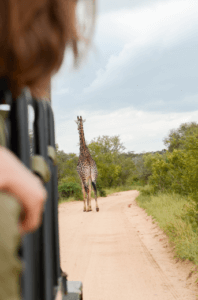 The experience of a game drive is indescribable. The weather was beautiful with just a tiny bit of a humidity. It was incredible and is hard to put into words. 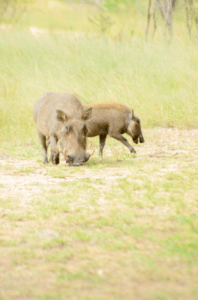 During our 2-night stay, along with the animals already mentioned, we saw hyena, leopard, zebra, owls, lions (male & female), hippo, rhino, kudu, monkeys, wildebeest and jackal. Safari is one of those experiences that should go on every bucket list. It is one that those of us that have gone, can try to explain, but until you go yourself, you will never truly know how incredible the experience is personally!